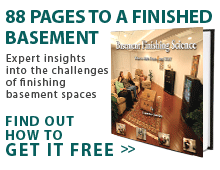 Is the basement in your Indiana home in need of an extreme makeover? If so, you're not alone. Luckily, there are knowledgeable and experienced basement remodeling contractors serving all areas of the Hoosier State, including Indianapolis, Fort Wayne, and Evansville. Our basement contractors have years of training and experience under their belts. You can trust us to complete any basement remodeling project you need, including basement walls, floors, windows, ceilings, insulation, and lighting. In no time at all, we can turn a dingy, unused basement into the most-used and loved room in your home.